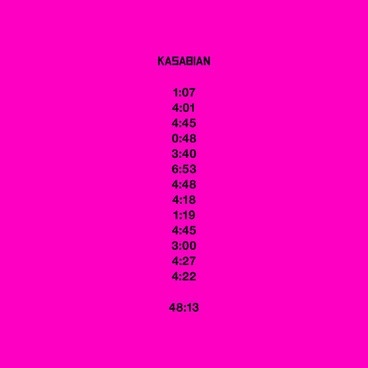 Album Review: Kasabian, 48:13 – music waffle. It’s followed by Stevie (who watches too much TV) about a slightly unhinged person, frankly a bit of a menace, wondering about with a gun when they really should be taking their medication. It’s a tight number, with a perfect arrangement of musical elements – judiciously used strings, a drum laden backdrop mid song, building up to the full works by the end of the song. This is classic Kasabian. Kasabian’ last album, Velociraptor, was one of my most played CDs of recent times, and my only irk was the title track, which was frankly daft. Doomsday (a bit of a blot for me) is reminiscent of this in that it has a Hanna Barbera come B52s cartoonish element to it. I sometimes wonder if professional critics/reviewers understand that you can still be a fan and not like all material your favourites produce. You accept that you probably wouldn’t get the bravery that gives you the brilliant stuff without these less desirable moments. And don’t harp on about lyrics not being particularly meaningful. Frankly we don’t care (sticks fingers in ears, La la la). We then start heading into a zone of unfamiliarity with Treat, the first part of which is as infectious as anything I’ve heard in a long while. The bass line is very simple, but is the backbone of the hook. There’s utter genius in a rock band producing what is basically an incredible dance track. I’ve always admired the way Kasabian manage to fuse rock and strings so effectively, but they are heading down the experimental synth route here and with Explodes. It’s almost like hearing early efforts by The Human League with a hefty slice of Chemical Brothers. Then Glass chucks in a bit of rapper Suli Breaks – I guess you can’t accuse them of standing still. When we get to Clouds, we are back in familiar top notch territory – it really is a cracking track. We rise above the clouds” is accompanied by a euphoric echo. Sergio Pizzorno really gets how to use light and shade, noise and silence, anticipation and big moments in his song writing. And I must give high praise to them for releasing Eez-eh as an opening single. Not that I think it is a masterpiece or anything, because I don’t. In fact I thought they’d possibly lost some marbles somewhere in the Leicestershire countryside when I first heard it, so left field did it seem. It’s just that I have a huge bugbear with how many artists these days release the most bland and average tracks from their albums as singles. You see it repeatedly. It’s as if radio stations and pluggers are attempting to give us a life of beige aural wallpaper, when frankly a bit of pink does the trick. At least Eez-eh is good fun and quirky (“Life is brutal, now we’re being watched by Google”) And whatever the few imperfections of this album, it is most certainly colourful. The album rounds off with the gentlest singalong track on offer, SPS, a rather nice contrast to the rest of the album. I can’t wait to watch the headline set at Glastonbury, because Kasabian certainly know how to “work it, work it like a Treat”. I haven’t got goolies. But if I had, it’s the most goolie-grabbing album of the year so far.